I, too, have found myself alone and feeling sorry for myself as I allow the world of entertainment to steal precious time from me that could be spent in face-to-face conversation with the people I care about and who care about me. When a life becomes too busy to stay in touch with those who will “encourage, comfort and urge us to live lives worthy of God, who calls us into his kingdom and glory,” (I Thess. 2:12) we have missed the great joy of living. As I was preparing to write on this topic I started looking up “fellowship” in the concordance and much to my surprise there was an emphasis I had missed. The Bible speaks of fellowship as an offering, as in fellowship offerings. In Old Testament times people were not only taught to bring prescribed offerings for sin, but offerings that were called fellowship offerings. My understanding of these were that you brought an offering into the Tabernacle and then it was cooked and you and your family ate together before the Lord in the courtyard. The idea was that you shared this meal together, but, as I reread the passages on fellowship offerings again, I realized that the real reason you were to bring these offerings was for the opportunity to fellowship with God. You brought the offering, it was cooked, the fat aroma rose up to the Lord, and you sat down and ate the meal with your friends and relatives, but it was with the idea that you all ate or enjoyed the presence of the Lord. (Deut. 27:7) It was the fellowship not only with each other but the Lord. His presence was there at the fellowship dinner. 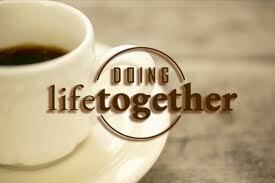 Later the Lord gave us the opportunity to fellowship with Him every day when He sent the Holy Spirit to live in us. I love 2 Cor. 13:14 that says, “May the grace of the Lord Jesus Christ, and the love of God, and the fellowship of the Holy Spirit be with you all.” I think that these are perfect descriptions of the way we are to relate to God. Jesus Christ is the giver of grace, God the Father is the giver of love, and the Holy Spirit is given to us as the way to give and receive fellowship with the Lord. The Lord also knew that we would need encouragement and someone to build us up, so New Testament believers were encouraged to gather together, eat together, praise God together, encourage one another, and spur one another on toward love and good deeds. Hebrews 10:24-25 tells us to “not give up meeting together, as some are in the habit of doing, but let us encourage one another–and all the more as you see the Day approaching.” The gathering together in fellowship always included God in the midst. I know that after I spent face-to-face time with my Christian friends the discouragement I had felt from the trials I was in lifted. They not only listened to me, they offered Kleenex for my tears and comforting words and pointed me to the Lord who has all the answers. I left better off than when I came, with a resolve to do better at making time for face to face fellowship in the future. It is better than Facebook, or texting, and even phoning. There is nothing like the touch of a hand, a face that shows you see my heartbreak, or a hug and a promise of prayer for touching the deepest part of my longing to be comforted, understood, and loved no matter how self-absorbed my confessions seemed to be. It surely was more satisfying than waiting for a reply to my e-mail. My last point is that it seems the Lord expects that there would be sacrifice as an aspect of fellowship. In the Old Testament practices it would cost you not only time but one or more animals. In the New Testament there was a cost of time, of putting fellowship with your family, friends, and the Lord as a daily priority. In this day and age fellowship with the Lord and fellowship with friends will cost you not only time but will ask you to shut down the world’s tech temptations so you can get back to a meaningful interaction with one another. It is a sacrifice but I promise you it will be worth it.